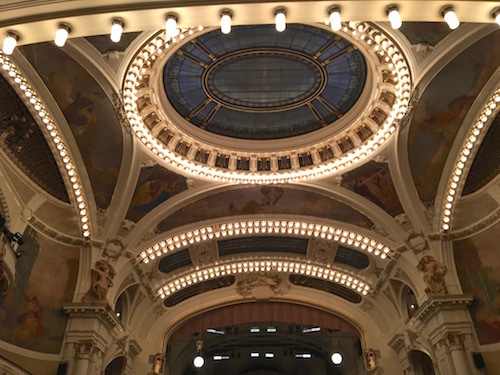 Prague has had a turbulent past with different rulers and occupation, but it's now finding its own voice, and balancing old and new, with history and development. Prague was founded in the 9th Century and went through centuries of Roman Empire Kings and Austrian Habsburg rulers, but didn't become the capital of the still to be created, Czech Republic, until 1918. Even after 1918, Prague endured Nazi Germany occupation for 6 years and then lived through 4 decades of Soviet backed communist dictatorship. It wasn't until 1993 that Czechoslovakia split in two and the Czech Republic was created and the first President was elected. The current President lives in the Prague Castle, and hasn't developed the best reputation during his time in office. Comparisons were drawn between his volatile personality and that of one of our current Presidential hopefuls, who is not a woman. There was a group of protestors who weren't happy with some of his policies, so they snuck onto the roof of the Castle and swapped out the flag for a giant pair of red boxers. The President didn't find the humor, and set up new security measures after the incident, requiring searches of everyone visiting the grounds. This in turn has caused long lines when visiting the once tourist-friendly Castle, and caused me to miss seeing the interior due to the long wait. Luckily there's many more things to see in Prague. There's a lot of cultural activities in Prague and some say that's to make up for the lack of religion. The country has one of the largest atheist populations. Because they had so many different rulers and changing religions, people just stopped believing entirely. They turned their attention to theatre and classical music instead. 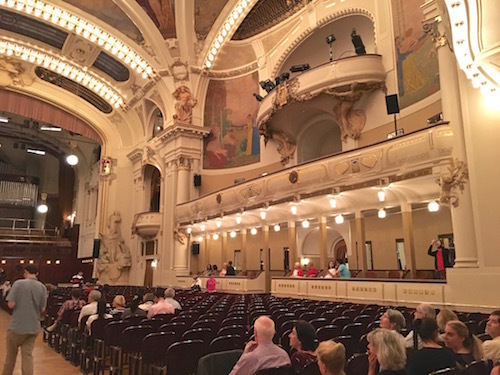 There are larger theatres like the one at the Municipal House where you can catch bigger scale performances, but there are also smaller facilities tucked into many of the tight passageways around town. 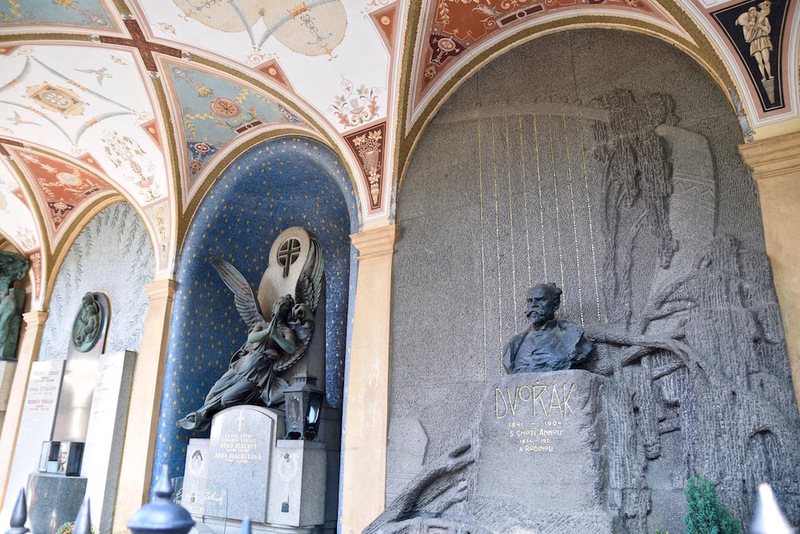 Dvorak was from Prague and is buried there in a most unusual, but beautiful cemetery on the grounds of Vysehrad Castle. Mozart also spent a lot of time performing in Prague and the locals loved him. They were said to have given him a lavish memorial service with hundreds of musicians paying respects and performing, whereas his funeral in his hometown of Vienna was poorly attended without any special music. Tourism has grown exponentially in the 25 years since Prague's independence. One could say it has grown too much with bachelor and bachelorettes coming in from all over Europe. Tourism is at an all-time high with 6.6 million visitors per year, and record breaking increases annually. The Old Town, which is the busiest tourist center of Prague, overflowed with people during our entire visit. The Old Town Square was filled with selfie sticks and street performers, where luckily, there was a new ban on music, so there was no competing sounds playing in the congested area. There were random segways rolling through the square, even though those were recently banned as well. Visitors crowd elbow to elbow, camera to camera, at the top of each hour to see the Astronomical Clock sound with odd little mechanical figures circling around and bobbing up and down for about a minute. You'll stand there like the rest of the people, and then wonder why you did at the end as well. When the short, anticlimactic show is over, people scatter to other noteworthy stops in Prague like The Charles Bridge, which too is filled will tourists morning and night, admiring the River Vlatava and the dozens of saintly sculptures that line the perimeter. 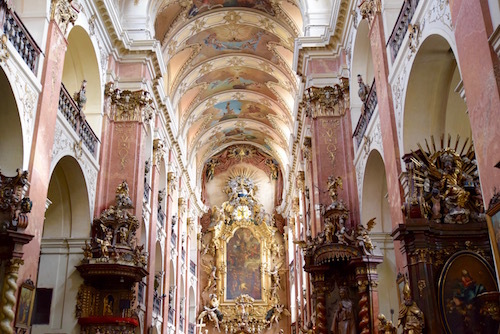 Luckily you can find a little quiet in some of the beautiful religious buildings around Prague like St. Vitus's Cathedral, the Church of St. Nicholas, St. James and the Church of St. Giles. Given the lack of religion, these churches to be more filled with tourists than worshippers. 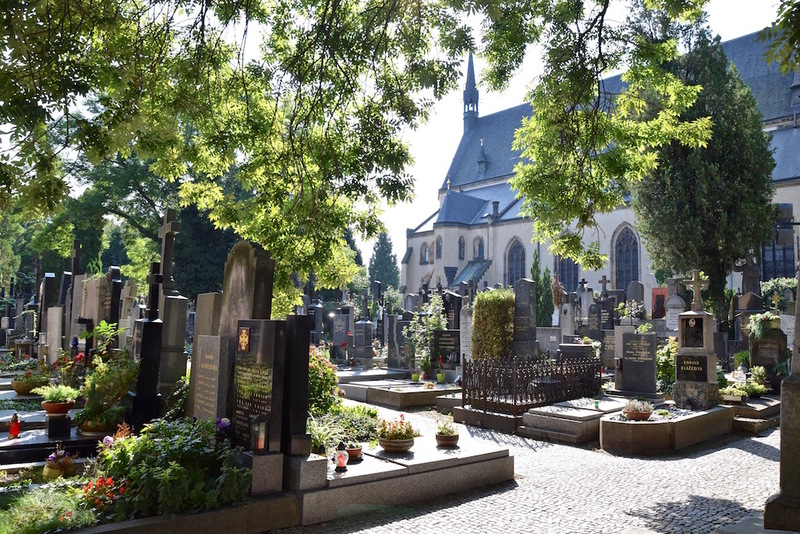 Prague's Jewish Quarter has quite a few synagogues and a cemetery that survived Nazi occupation that you can tour as well. Walking through the Jewish Quarter, I asked our guide about a new restaurant, Field, that I wanted to see. Her 20-something eyes did their best not to roll back into her head as she questioned my choice. Field had taken over a long-beloved Prague institution and replaced it with a new farm to table restaurant. I think many people have experienced this same feeling in their own city when gentrification knocks out your favorite dive bar in place of the concept du jour. There was much of that going on in Prague. Our young guide pointed out various other establishments around Prague that had been taken over by foreign money (many of whom have been coming from a country that rhymes with Bussia). With new money, places are being flipped, often with different people and different cultures, so there's a fear, in addition to extreme sensitivity, of losing some of Prague's new, hard-earned identity. The best place to escape the crowds, politics and gentrification in Prague, is the Strahov Monastery, my favorite stop. Inside the monastery are the two most beautiful Baroque libraries I've ever seen (insider tip: pay for a VIP tour so you can have the place to yourself). The Monastery was founded in 1140, burnt down, and was rebuilt and transformed into its current Baroque form in the 18th Century. The Theological Hall has over 18,000 books with one wall containing nothing but Bibles. The larger Philosophical Hall has 42,000 volumes of books ranging from astronomy to history, mathematics and philology. A giant fresco on the ceiling depicts the "intellectual Progress of Mankind" and shows how science and religion collide. Monks can still be seen coming into the library and checking out books to review. You can see paper placeholders in some spots where a book is on loan. Prague has had a lot of different influences in their city and country over the centuries. They've stood strong through many countries' occupations and are now balancing their own identity with new development and their cultural history. Tourists are flooding in to see what's happening, and I'm also eager to follow Prague's evolution. Next up, I'll talk about the changing food scene in Prague. Read here. Want more European travel inspiration?